Lock in a great price for House Cun – rated 8.5 by recent guests! Location, next to the lake,new and old city. Room was really spacious, and relatively clean. excellent location at the water, , Friendly helpful Staff and very clean. Одлично ! Прекрасна локација ,прекрасен персонал ! Го препорачувам . 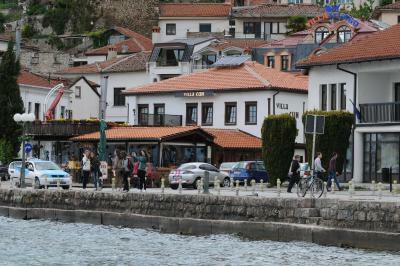 The rooms were clean just in front of the waterfront of the lake Ohrid. Superb view! Perfect location, clean rooms, friendly staff. Recommend this place. Excellent location on the lake shore, cosy and clean room, excellent breakfast. Perfect location and amazing view from the window. The house and our room were very clean and in a quiet neighborhood. The shared terrace is looking at the vineyards which was great for morning coffee and breakfast which was very tasty. We recommend the B&B since we really enjoyed our stay there. Breakfast very good, the best location in town with private parking , room not enought big but comfortable ,you must eat at the restaurant , the best view in low prices .. The staff was friendly. Great location. And the restaurant is an advantage. They also kept a parking space for me. Located on the shores of Lake Ohrid, House Čun offers free WiFi, free air conditioning and an à-la-carte restaurant. Free parking spaces are available on site. The units at the Čun come with views of the lake, cable TV and a mini-bar. The private bathrooms are fitted with a shower, a hairdryer and free toiletries. Breakfast can be enjoyed daily at the property and a traditional dinner is served at the on-site restaurant. The closest grocery shop is 150 feet away. 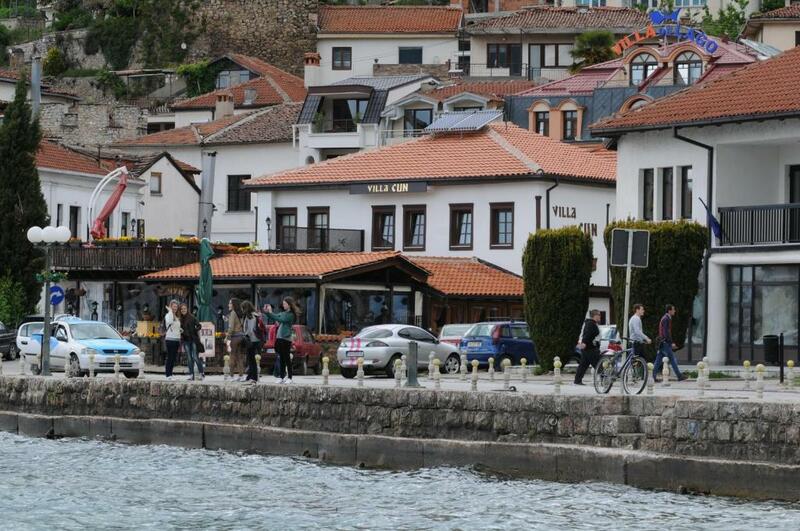 Ohrid´s Old Town is only a few minutes´ walking distance away. When would you like to stay at House Cun? This air-conditioned room comes with views of Lake Ohrid, a flat-screen TV with cable channels and a mini-bar. The bathroom is fitted with a shower, a hairdryer and free toiletries. This air-conditioned suite comes with lateral views of Lake Ohrid, a flat-screen TV with cable channels and a seating area. It also features a mini-bar and the bathroom is fitted with a shower, a hairdryer and free toiletries. This air-conditioned room comes with a flat-screen TV with cable channels, a mini-bar and a bathroom with a shower. A hairdryer and free toiletries are also provided. House Rules House Cun takes special requests – add in the next step! House Cun accepts these cards and reserves the right to temporarily hold an amount prior to arrival. Please inform House Cun of your expected arrival time in advance. You can use the Special Requests box when booking, or contact the property directly using the contact details in your confirmation. Restaurant with excellent food and music made our staying even more pleasant. Poorly converted guest rooms with NO SOUND INSULATION.Could hear clearly guests in other rooms. Very disinterested staff.Didnt see one smile entire 4 day stay.. However cleaning lady was pleasant!. Limited choice of very basic breakfast. No information about that the road to hotel is closed even if the hotel knew that we were arriving by car. Nothing special, maybe islation betweeen the rooms could be better, but it does not interfere while resting. Everything was to my satisfaction. Clean, 2 feets from the lake, perfec.